In the last couple of years, I noted less and less traditional concepts open their doors in Luxembourg and left the place to hybrid forms of business, similarly to what happened already in most of the other European capital. So – not just bar, but spaces integrated with shops, not just restaurants but also library, meeting point, concert hall. It happened also recently that there are places most of my friends have been already to and I did not feel interested to visit yet, until a certain point when their descriptions became so pressing, I decide to check in myself. Gastronomica Luxembourg, located in the area of Hollerich, is a clear example of both cases: a shop for Italian authentic products but also a restaurant and an after-work spot. A place most people I know loves, due to its products and its prices – this is a recurring reason, indeed. So, on Wednesday night, after a business meeting with Jenni, I propose her to give Gastronomica Luxembourg a try. Their Facebook page was sponsoring an after-work on that day, so we headed there around 7.30 pm. The restaurant is located in the complex of “Troc”, so we parked our car outside and walked in the building. The area is not very fashionable: the restaurant is overlooking a parking space and the atmosphere is very post-industrial..
We expected to find an Italian aperitif style, indeed when we entered everybody was seated at the tables having kind of dinner. Without hi or hello, a waiter came to us, asked if we reserved and, when we say no, he pushed us on a table next to the fridge. Actually – we said, we prefer staying outside. We move on the “terrace” and we took place on a old and dusty couch. The table in front of us was dirty but the waiter did not take care of it. We asked for two glasses of white wine and the waiter shortly came back with a half litre pitcher – he did not ask if we had preferences for the wine nor if the pitcher was fine. He then proposed us a mixed platter to accompany the wine and we accepted. 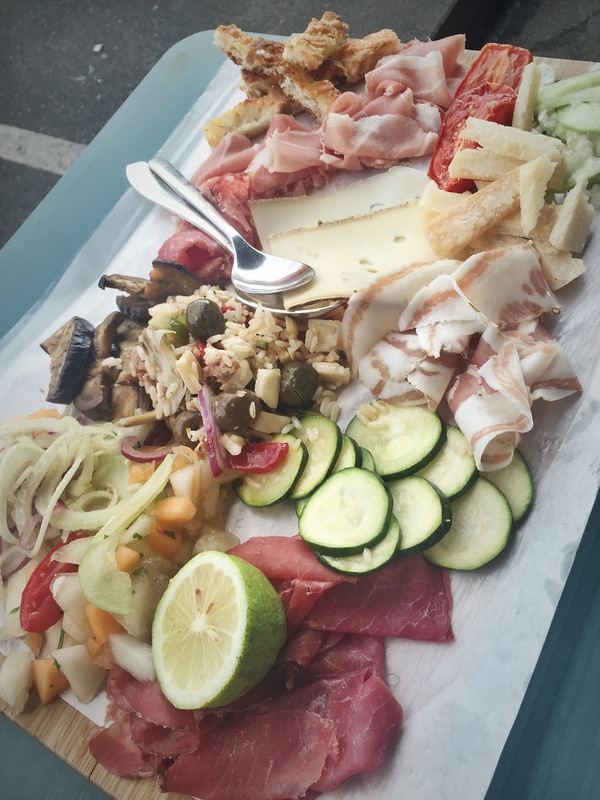 The platter indeed, even if composed only by cold items (charcuterie, cheese, salads, pickles) took ages to come. The food was very good and there was a quite good selection. Mostly cold cuts and cold salads, as well as some pieces of cheese and grilled vegetables. The quantity was huge for two persons and was accompanied by a huge basket of Italian bread. During the further hour we spent outside nobody came to check on us. We got to draw the attention of the waiter waiving to him inside. We ordered some more wine and a small cheese platter to conclude. The wine he took to us lately was different from the first one, randomly: the waiter just told us, he decided to give you some different wine – I wonder that was just the bottle they had open at that time-. Then, when the cheese arrived, he placed the platter on top of the fist one, that was still unfinished and with some pieces left. I can perfectly understand the needs of not being formal, but that was a bit too much. We finished the cheese and the wine and as the night was pretty chilli, we went inside to pay. I wanted to offer my friend the night, so I just asked the waiter how much it was in total and handle him my debit card. He said “15 euro” – no ticket and no menu with prices.. -. I found it incredibly low, but I supposed we paid only the wine and indeed everybody was describing it as very cheap place. I was leaving the room when the waiter shouted at me: “and you friend is not paying?”. Sorry – I said – I supposed it was the total, in fact I asked you “how much we pay in total”.. He told me he split it already for us – who asked? Gosh. The only thing I liked was the food that was pretty good and definitely cheap. Unfortunately, having a small bill is not the only important thing when going to a restaurant – otherwise it would be the same buying nice products and have them at home. Even if the place is brand new, details are left there, unattended. The worst I have seen in the restroom an unattached Ikea mirror left in front of the wc. The idea about having spare furniture to fill the “terrace” is not that bad, but still a bit of cleanness would help. In conclusion: I perfectly see people like Gastronomica for its good Italian food and cheap bill. At the same time, while I understand a place like this should not be formal, to me the service is an important part of the dining out experience and here was completely missing. I don’t feel I will come back any time soon. Confirmed. We had pretty much the same impression. It’s way to dirty to be safe IMHO.